Captain Sulu and the Excelsior crew return. . . with a few Klingons and one troublesome Trill diplomat! 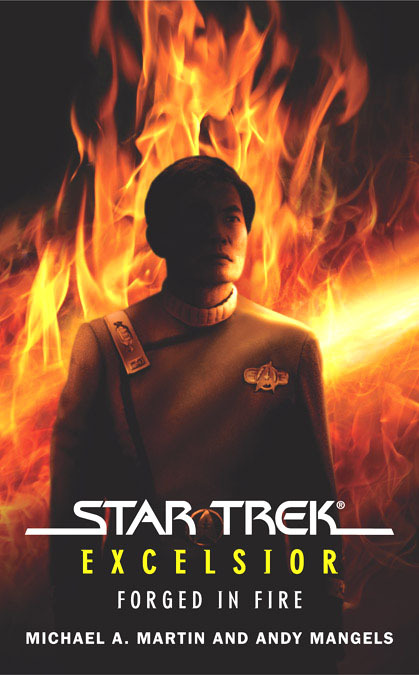 Following their spectacularly-reviewed work handling Captain Sulu and the crew of the U.S.S. Excelsior in Star Trek: Lost Era 2298 "The Sundered", Andy Mangels and Michael A. Martin return for a second Excelsior novel! In addition to Captain Hikaru Sulu and the crew of the Excelsior, some familiar faces from Star Trek history return: Kor, Koloth and Kang. . . and Trill ambassador Curzon Dax... all versus the albino Klingon seen many years later on Deep Space Nine! AN UNTOLD TALE OF STAR TREK - HISTORY REVEALED AT LAST.! A vicious pirate known as the Albino is cutting a deadly swath across space, creating turmoil in the Klingon Empire that threatens to spill into the Federation. 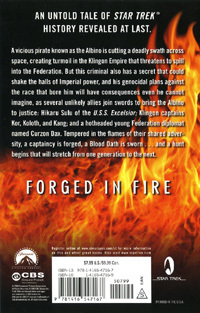 But this criminal also has a secret that could shake the halls of Imperial power, and his genocidal plans against the race that bore him will have consequences even he cannot imagine, as several unlikely allies join swords to bring the Albino to justice: Hikaru Sulu of the U.S.S. Excelsior; Klingon captains Kor, Koloth, and Kang; and a hotheaded young Federation diplomat named Curzon Dax. Tempered in the flames of their shared adversity, a captaincy is forged, a Blood Oath is sworn . . . and a hunt begins that will stretch from one generation to the next. HERE'S A SMALL TASTE... GO TO STAR TREK.COM FOR FOUR MORE PREVIEW PAGES...! "When nothing goes as planned, the world is in balance." It was an old Trill saying, and Curzon Dax found it circling through his mind every thirty seconds or so, like an annoying insect that couldn't be chased away. Though the mantra didn't accurately reflect his high hopes for the Korvat peace conference, by midway through the first day he had to concede that it was apropos. Excelsior's security team had been astonishingly thorough -- far too thorough for the Klingons who found the whole screening process invasive and the facilities here at the Korvat colony far too clean for their unrefined sensibilities -- and that had delayed the start of the talks for almost two hours. 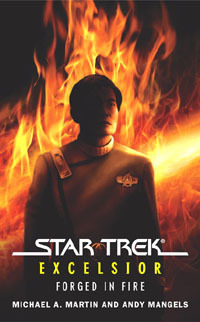 Even the calming influence of Ambassador Sarek had succeeded only in making the delays tolerable rather than "merely" maddening for the Klingons. Once the talks started, the posturing of the Klingons was almost Shakespearean in nature -- Curzon was familiar with the old Earth playwright's work largely through the memories of Emony -- especially that of Ambassador Kamarag, who was backed not only by a support team of junior ambassadors, but also by a trio of cocky warrior captains named Koloth, Kang, and Kor. Kamarag's voice rang loudly in the diplomatic hall, in bellicose contrast to Sarek's solidly emotionless and subdued tones. Dax knew that Sarek was a brilliant and enormously experienced diplomat, but he wondered just how well he understood the real cultural values of the Klingon Empire. Dax had little doubt that if even half of the boastful bluster that Kamarag had been spouting all day could be bagged and shipped, it could transform even the most barren Vulcan desert into a galactic agricultural marvel. Nevertheless, he also understood something of the substance behind the boasts; because he had made a careful study of Klingon society and biology during his undergraduate years, Dax suspected that he might understand its subtleties better than anyone present who had not actually been born on Qo'noS, Sarek included. Dax had noticed immediately that Kor and Kang had the smooth foreheads that labeled them as QuchHa'; their presence here today, and their influential positions as the captains of Klingon warships, meant that despite their culturally undesirable -- and fully visible -- genetic aberrations, they had clawed their way to the top. By contrast, Kamarag and Koloth and nearly all the other Klingons present possessed the more traditional textured HemQuch forehead. But Koloth, Dax had learned, hadn't been born with his HemQuch features, having acquired them later in life, after he had already achieved a captaincy, presumably in defiance of the same ingrained prejudices that Kang and Kor had had to overcome. GO TO STAR TREK.COM FOR FOUR MORE PREVIEW PAGES...! HERE'S A SMALL TASTE... GO TO SIMONSAYS.COM FOR THE COMPLETE FIRST CHAPTER! "The Lady Moj'ih grows impatient," Do'Yoj said brusquely. Her boots drumming an impatient rhythm against the stone floor as she walked, she ushered the two physicians down the dim corridor toward the sprawling villa's center, where its largest bedchamber lay. The master bedchamber had become the sole domain of the Lady Moj'ih ever since her husband Ngoj had fallen in battle against the cursed RomuluSngan at Nequencia nearly four months ago. And since that unhappy time, the ornate room's tapestry-draped walls had come to mark the boundaries of the Lady's existence. Do'Yoj thought it had become a veritable throne room for her reclusive mistress, who was now the de facto head of the House of Ngoj, one of the few ruling matriarchs among the noble classes of Qo'noS. And now, as the Lady Moj'ih's ever more complicated pregnancy advanced inexorably toward term, the chamber had become a prison in all but name. "My apologies," said Hurghom, the taller of the two doctors, speaking a bit too obsequiously for Do'Yoj's taste as he came to a stop behind Do'Yoj just outside the heavy wooden bedchamber door. Was he mocking her? Or was he merely trying to adopt the tone most appropriate for a smooth-headed QuchHa' such as himself? Dr. Nej, whose darker countenance contrasted sharply with Hurghom's owing to its prominent frame of cranial ridges, spoke a good deal more boldly. "I am sure that the Lady Moj'ih will understand the reason for the delay," Nej said, raising to eye level the small black valise he clutched in his gnarled right hand, as if to emphasize his point. "The procedure we must undertake this day requires the utmost delicacy if we are to avoid bringing harm to the Lady's child." "We have to be certain that we get this right in every detail," Hurghom said, his disturbingly smooth head bobbing in agreement with his colleague's words. "I'm sure you will agree that much is at stake. And what is at stake is nothing less than a male heir to the House of Ngoj." A future patriarch of this noble House, Do'Yoj thought with no small amount of resentment. An heir who will doubtless have as much to conceal as his parents did, if he is to maintain this House's power and prestige. Answering Hurghom with only a tart scowl, Do'Yoj turned and pushed on the door with her shoulder, leaning into its superbly balanced bulk so that it began to move smoothly and silently inward on its well-oiled duranium hinges. The room beyond the threshold was dark, shrouding its sole occupant in gloom. Do'Yoj entered and stepped to the side, allowing the physicians to waste no further time before converging upon the large bed that was mounted on the raised dais in the center of the room. Do'Yoj wasn't entirely sure that the Lady Moj'ih was actually in the bed until she spoke, her rounded belly moving noticeably beneath the tangle of bedclothes. "What is the reason for your tardiness?" the Lady said, addressing both physicians in an imperious tone suited to a woman of noble breeding. Do'Yoj thought it was a tone suited to one born to the birthright of the HemQuch, those who, unlike Dr. Hurghom, possessed the cranial ridges that had been the genetic patrimony of every Klingon, from the boldest warrior to the humblest tiller of the soil, since long before the time of the unforgettable Kahless. Do'Yoj, of course, knew the real truth behind the Lady's brave façade. As the Lady Moj'ih's most trusted personal retainer, there was no way that Do'Yoj could ignore the fact that her haughty, proud-visaged mistress was actually just as smooth-browed -- and thus every bit as disgracefully QuchHa' -- as Dr. Hurghom and his ancestors. Do'Yoj was all too aware that the Lady's striking brow ridges, scarcely visible in the room's dim light, were prosthetic fakes. They were biosynthetic implants -- which required frequent cosmetic maintenance, despite having been surgically attached to her skull -- and had been used covertly by members of the influential House of Ngoj ever since the Great Qu'Vat Plague of 1462, a disaster that lay more than half a century in the past. Maintaining the noble deception with sufficient care from day to day is becoming too taxing for the Lady in her current condition, Do'Yoj thought, blending invisibly into the blood-hued tapestries as she watched her mistress begin conferring with her physicians, one of whom applied a moist towel to her forehead, which the Lady held in place with her hand, covering up her false brow ridges. If the Lady Moj'ih would not trust even Do'Yoj to see to the upkeep of her prosthetic forehead -- perhaps she was unwilling to appear vulnerable before a social inferior whose own natural cranial appurtenances marked her as one of the Lady's biological betters -- then it was unsurprising that Moj'ih had opted to hide her chronic shame using both a towel and a shroud of darkness. "We came as quickly as we could, My Lady," Dr. Nej said, matching the Lady Moj'ih's brittle tones with the no-nonsense manner of a senior physician who was used to receiving more deference from his patients -- even the noble ones. Perhaps, Do'Yoj thought, this is because he, too, knows the truth that the Lady must keep concealed at all costs. "The procedure we must undertake has not received extensive testing prior to today," said Hurghom, again speaking in that placating manner that Do'Yoj found so very irritating. "We had to be as certain as possible of the outcome before proceeding with the final phase of the child's genetic alterations. Especially in light of...the unfortunate occurrence not so very long ago on Qu'Vat." "I should think you would be the last one to remind anyone of your failure at Qu'Vat," Moj'ih said, the moist, sharpened points of her bared teeth glinting in the room's scant light. Though she remained standing in silence at the room's periphery, Do'Yoj was inclined to agree. How many had died on the Qu'Vat colony during Hurghom's most recent attempt to rid the Klingon people of the Earther genetic baggage with which his ancestor Antaak had saddled them during the previous century? The death toll had to be in the tens of thousands, at least. That many QuchHa' had died in the space of a single afternoon, the shame of their Earther-smooth foreheads -- the tragic, so-far-indelible mark with which Antaak had imprinted their forebears decades earlier in the process of saving them from the Levodian plague -- compounded with the shame of being denied entry into Sto-Vo-Kor through a warrior's honorable death in battle. Do'Yoj reflected that Hurghom's failure could have been far worse. After all, the doctor's ancestor Antaak had inadvertently killed millions during his own attempts to rid the Klingon genome of the Earther taint he had inflicted upon it decades ago. "Wisdom comes from experience," Dr. Hurghom replied in a meek voice. "Just as experience may come from foolish errors," Nej added with an audible sneer as he set his black valise upon the foot of Moj'ih's bed and opened it. He withdrew a wicked-looking, almost mek'leth-sized device that Do'Yoj assumed was a hypodermic needle, along with a small handheld scanning device. "My Lady, can we get some light in here now?" Nej said, displaying his instruments as best he could in the room's inadequate illumination. "Then we can get on with the task ridding the next head of the House of Ngoj of the consequences of Antaak's so-called cure." Responding to a nod from her mistress, Do'Yoj moved toward the lighting controls in the chamber's southeast corner and brightened the room. She watched in silence as Nej slowly pulled back the bedclothes, raised the needle, and leaned toward the Lady Moj'ih. GO TO SIMONSAYS.COM FOR THE COMPLETE FIRST CHAPTER!